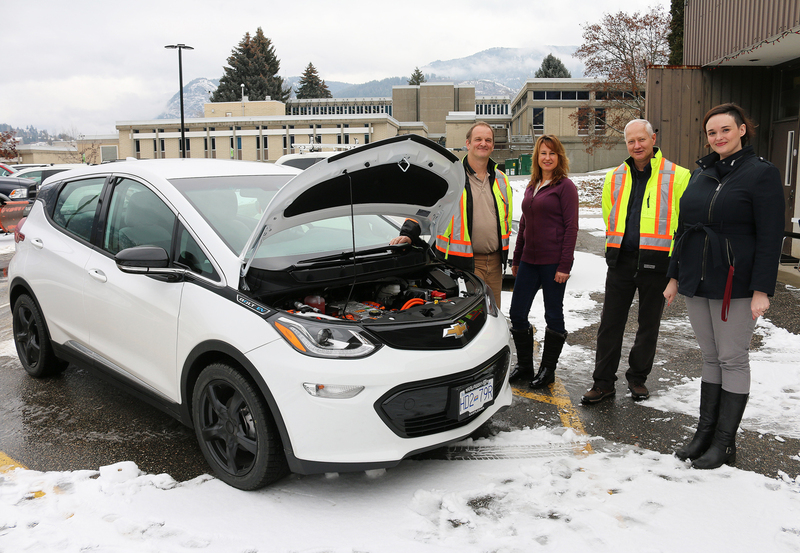 The Selkirk College maintenance department closed out 2018 with a glimpse into the future by adding a new Chevrolet Bolt EV to its fleet. The fully electric vehicle was purchased from Castlegar’s Kalawasky Chevrolet Buick GMC and replaced an aging 1998 cargo van in the eight-vehicle fleet that services both the Castlegar and Nelson campuses. Only available by special order and still a rarity on West Kootenay roads, the new ride is a perfect addition to the maintenance team. The move to electric vehicles is part of Selkirk College’s ongoing sustainability initiatives that include everything from a computerized outdoor lighting system that maximizes efficiency to upgraded recycling stations to student engagement projects. The new Chevrolet Bolt is 100 per cent electric and the estimated cost for operating the vehicle annually is less than $500. The Bolt can run 383 kilometres on a full charge. Future vehicle purchases will place an emphasis on electric vehicles when available and suited to the tasks required.